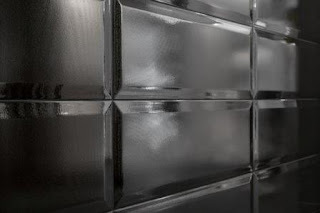 Avente Tile welcomes a new tile perspective to our blog. Our guest post is provided by Ruth Hinds on behalf of Tons of Tiles, U.K.-based importers and suppliers of a wide range of quality floor and wall tiles for bathrooms, kitchens, and any area of your home you would like to improve. 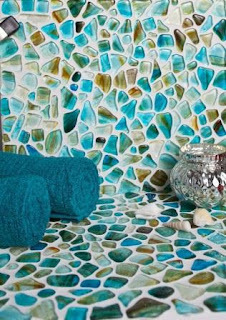 A mosaic wall is one of the best features that you can have in your home. Not only is it highly personalized and individual, it's also really easy to create once you know what you're doing. Let's take a look at how you should approach the task. Planning is key to success, so make sure that you have everything you need before you get started. This is likely to include adhesive, grout, a grout scraper, gloves, and safety glasses. Then, it's just a case of picking the best tiles for your job! Handmade porcelain tiles are made with the most care and love, so are a great option when you want to make something really special. The colors and designs that you'll find are almost endless. A dedication to using handmade tile products doesn't mean you compromise on results; rather, you're installing a sense of uniqueness into the existing style of your home. The joy of creating a tile mosaic is there is no right or wrong. Feel free to let your imagination run wild, and go with whatever patterns or designs appeal to you. A haphazard approach might even make the best results, so just go with the flow! As you can see, it really is simple to create a mosaic wall feature. Have you ever made one? Do you have any tips you'd like to share? If you follow this blog, you know there's nothing I like better than sharing a tile installation photo from our customers! I received an email a few weeks ago from some good people who live by the Maine coast near Acadia National Park. They were kind enough to show us how they used Avente's Spanish Cadiz Tiles! "Attached are some closeups of the tiles as I installed them in our kitchen. Also attached is a photo of our cozy house looking eastward out to Penobscot Bay. Thanks for assembling such a pleasing collection of tiles for our selection." Avente Customer's cozy home looking eastward out to Penobscot Bay. The Ryans, who shared these photos, chose the vibrant hand-painted Spanish Cadiz tiles to add focal points to the white tile backsplashes behind their oven and kitchen sink. We think the unexpected pops of color and patterns add interest and energy to these spaces! It's a great example of how different sizes of decorative tile are used to bring both pattern and color to a design. One aspect about this project that I love is that they choose decorative accent tile based on their desire to add interest and color to their kitchen. Occasionally, I hear, "I love those Spanish tiles; but, they don't work with my home's style." Often, different styles can complement one another and I have to admit the bold gold and blue in this Spanish Cadiz work well with this New England kitchen's maple cabinets, white field tile and clean, functional layout. I have to tell you that the Cadiz wasn't the Ryan's first choice. Originally they ordered some Spanish Burgos 2"x2" tiles. While the blue glaze in some of the tiles was exactly what they were looking for; some of the tiles in the lot didn't have the same vibrancy the Ryans wanted. This is often the case with hand-painted tiles because the hand of the artist can be seen in each tile. Showing Yankee perseverance, they discussed a few options with me and then asked if they could return the Burgos dots and try the Cadiz 4"x4" and 6"x6" formats. We had a winner! And, I love how they used the tiles differently behind the sink and stove. The Ryans used a unique way to lay out the tiles that really focused on scale and size rather than color and pattern. Below is a photo of their paper layout demo. 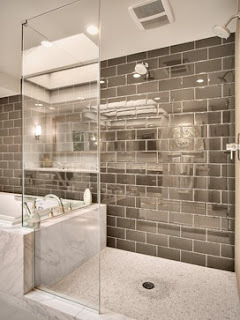 They explain, "Here is another aspect of our tile project that might have interest for your blog readers. Before ordering anything, we made a full-size paper mock-up of the two splash areas to be tiled, using colorful squares cut from magazine photos to represent the accent tiles - which allowed us to play with different layout options and really evaluate the impact of potential layouts in situ (on the wall), and in our case, to thus evaluate the interplay of the design of the two separate splash areas. We were trying diagonal accent layouts at first, comparing them to vertical/horizontal patterns, and playing with spacing of the accents. All easy to do with scotch tape! After the switch from 2-inch to 4-inch tiles as the material we chose to work with, and after the first order of 4-inch had arrived, we again used full-sized paper mock-ups to play with different configurations. And that's when we decided to go for a very different layout from the initial plan, which necessitated ordering a few more tiles. 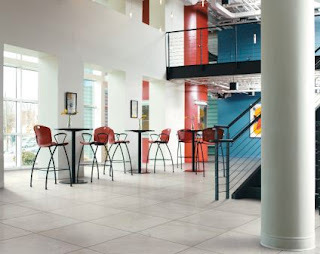 Since the tiles differ in size, the use of proper sizing of the background grid and of the accent tiles also promotes recognition of the required layout that will be necessary and to avoid additional or excessive cuts, awkward edges, or thicker grout lines. Going through the physical mock-up process can be very helpful to generate the most satisfactory end results." I agree, it's difficult to envision design concepts on any scale and to take into account all of the details. But, it's that work and effort that really shines through on your installation. Not only is the layout clean and professional, but the two backsplash designs work well together to provide a cohesive design. It's always a good idea to lay out the design to get a sense of what works, and to find any flaws you might not have thought about. Finally, the Ryans pointed out that, "The reason we used paper magazine cutouts for accents is that you get the exact size of accent pieces. I suppose someone could print a set of photocopies of the desired accent tiles and trim to correct size if the printing process does not generate a correct size (tricky). That would produce a more realistic mock-up than the magazine clipping approach." If you enjoyed this article, you might enjoy these Tile Talk articles that show how Avente customer's have added style and a personal touch to their homes with hand-painted ceramic tiles. Here are a few posts devoted to tile floor accents and kitchen backsplashes using our hand-painted ceramic tiles. 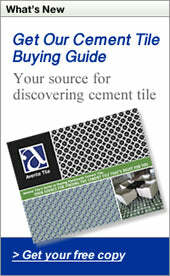 These posts show you how cement tile can be used on floors and kitchen backsplashes. You'll also discover the decisions that each customer experienced as part of the project. I thank these customers for taking the time to share these tips and ideas. 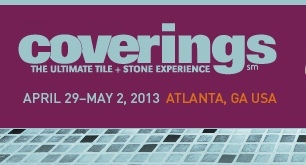 With its eye towards the future, Coverings 2013 has remained steadfast in its quest to provide the best possible experience for the attendees of its annual tile and stone trade fair and expo. Set for April 29 to May 2 at the Georgia World Congress Center in Atlanta, Coverings is prepared to help its attendees tackle real-world installation situations, preview the latest in tile and stone designs and products from global providers, and help attendees utilize their time and efforts within various social media platforms. It’s this dedication to innovation and resourcefulness that continue to drive the success of Coverings and make it a must-attend annual event. Once again, Coverings will be host to hundreds of exhibitors, distributors, retailers, fabricators, contractors, specifiers, architectural and design professionals. The four-day exposition serves as a valuable resource for continuing education within all segments of the industry. There are more than 70 informative, accredited seminars and live demonstration sessions offered throughout the show, all of which are free of charge, thanks to several sponsors, including Ceramic Tile Distributors Association (CTDA), Tile of Spain/Spanish Ceramic Tile Manufacturer's Association (ASCER), Ceramics of Italy/Confindustria Ceramica, National Tile Contractors Association (NTCA) and The Tile Council of North America (TCNA). Tile of Spain Pavilion: More than 40 ceramic and stone manufacturers from Spain will showcase some of their most advanced ceramic tile technology and breathtaking design choices. Guests will experience cutting-edge technology, sustainable design and diverse architectural solutions from leading Spain tile manufacturers. To get started on the Spanish tile journey, first visit the Tile of Spain booth (#3309), located in the center of the pavilion, where you’ll find a variety of literature, including directories of the “must-see” Spanish tile exhibitors at Coverings. You can find a preview of the 43 Spanish tile and stone manufacturers participating in the Spanish Pavilion. Tile of Italy Pavilion: The 3,000-square-foot Piazza Ceramica (Booth #2231) designed by e+i studio, will once again be in the heart of the Italian Pavilion. Serving as the main information point and gathering space, the pavilion will be surrounded by displays from dozens of Italian tile brands. The Ceramics of Italy booth will feature a popular café and coffee bar, offering authentic Italian cuisine for breakfast, lunch, and afternoon aperitivos every day of the show. The Piazza also serves as your starting point to viewing Italian tile collections and design trends from nearly 50 Ceramic Tiles of Italy exhibitors. Installation Design Showcase: This is the place where attendees can observe masterpiece-worthy collaborations between NTCA Five Star contractors and Atlanta-area design firms. These partnerships produce beautiful designs and highly skilled installation techniques. This year’s vignettes include a bar/lounge, hotel lobby, inpatient room in a women’s birthing center and a master bathroom being created from inception to completion right on the show floor. For Coverings 2012, Foreman Rogers, senior designer from tvsdesign in Atlanta, designed this boutique guest room. Image courtesy of Coverings. SCAD Tiled Bench Exhibit: Coverings teamed up with the Interior Design Department at the Savannah College of Art and Design (SCAD) where through a 10-week course, students learned how to design and tile six benches. These benches will be displayed at Coverings, after the show, be permanently located on the SCAD campus. Coverings Central: This interactive and vibrant area, located on the show floor, will be home to many Quick Fire sessions addressing both social media and complementary industry topics. Located in booth 6457, these 20-minute sessions are designed to highlight the synergy between the tile and stone industries and social media. Within Coverings Central, attendees can also check their email in the Internet Café, get a photo taken in the Coverings 2014 photo booth with Las Vegas showgirls, view the PROJECT: Green display, relax at the bar, and so much more! As the largest and most-attended show for the U.S. tile and stone industries, it’s important that manufacturers get a head-start on new designs and materials to debut their latest creations in time for Coverings. With that in mind, here is just a sampling of the newly unveiled collections and series you’ll be able to see and touch at the show. Pulling inspiration from fashion, Jorge Aguayo hopes to have you on, "Pins & Needles." 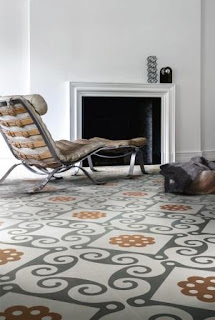 The handcrafted collection of fabric-inspired field tiles and trims are all made of cast cement and marble dust. They come with an exhaustive color palette, too. "Pins & Needles" takes its romantic yet edgy cue from the fashion trend of combining lace with textured fabrics. The complete collection will be on display during Coverings at Wholesale Tile by Aguayo's booth (#7941). Pins & Needles is a handcrafted fabric-inspired collection of textured cement tile by Wholesale Tile by Aguayo. The Manhattan Collection from Bedrosians. Image via Bedrosians. The Alhambra series from Kalebodur. Image via Kale Seramik. 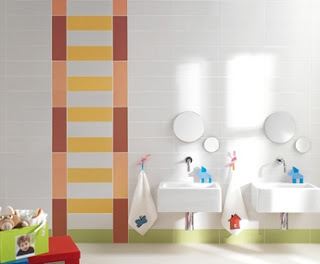 SistemC CITTA Wall Tile by Marazzi Architectural. Image via Marazzi Architectural. Crossville's Virtue Porcelain Tile Collection. 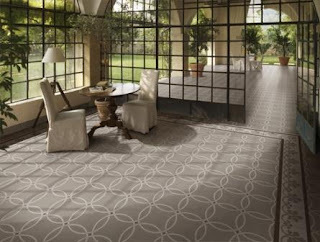 The Riva Del Mar Collection by Country Floors. Image via Country Floors. For additional information, list of exhibitors, a comprehensive session schedule, and more, please visit www.coverings.com, or contact National Trade Productions, Coverings Show Management, 703-706-8257. I'll see you there! Bring the outdoors in with our Leaf Imprint Tiles! These decorative leaf tiles are pressed with real leaves, giving them a fossilized look. Our leaf tiles are hand-colored and offer a subtle way to enhance your kitchen or bathroom with a decorative touch. Imagine my delight when Tom Auer, owner of landscape design and construction firm, The Ground Crafter, contacted me the first of the year about using some of our Leaf Imprint Ceramic Tile for an upcoming trade show exhibit they would be attending. He explained that the tiles were to be used on a water feature, and that he needed them right away. Unfortunately, we did not have any of the 8"x8" pieces in stock and the smaller 4"x4" format wouldn't work for him. Avente Tile works closely with its tile artisans and we can often beat the standard delivery time, or find ways to improve delivery with expedited freight or shipping. Of course, the artisan agreed and the tiles arrived in time for the show. Pressed with real leaves, these decorative hand-painted 8"x8" tiles include a Maple Leaf, Ash Leaf, and Ginkgo Leaf design. Tom chose one of each of the following designs in the 8"x8" format to create a triptych that has perfect balance. Our Leaf Imprint tiles are popular kitchen backsplash accents; but, I think this is the first time they have been used as part of a trade show set. The Ground Crafter team created the most tranquil, peaceful exhibit space I've seen. Congratulations on a nice job, Tom! I'm glad we could help with the tiles. 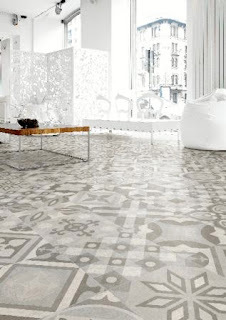 If you're looking for further inspiration with hand-painted decorative tiles, then we urge you to visit our Ceramic Tile Design Ideas portfolio for detailed installation photos and concepts. NOTE: Images of the above trade show water feature are courtesy of Tom Auer, owner of landscape design and construction firm, The Ground Crafter. Spring arouses the senses with its freshness, renewal, and reawakening of the vivid colors of flora and fauna alike, and of course, the energy exuded like no other season. It's with this energizing euphoria where many renovation projects are launched. Be it the bathroom that needs updating, floors that need freshening up, a kitchen that needs brightening, or an outdoor water feature you've been yearning to tackle, Avente Tile can help you meet any design goal. Our extensive Design Ideas gallery features a large collection of projects that incorporate our handmade and hand-painted ceramic tile, cement tile, decorative tile, mosaic tile, and so much more. In honor of Spring and the month of April, we've selected a sampling of ceramic and cement tiles that would fit in perfectly with your current or upcoming projects! Our Arabesque Cement Tiles and Rustic Cement Tile Pavers are a durable and green product. Made with locally sourced sand, cement and aggregate, which minimizes the transportation fees and costs associated with these raw materials. Pinterest has grown into a social media phenomenon that inspires people, projects and most importantly for business, verified revenue through purchases, as well as increased website and blog traffic. Through increased exposure via Pinterest, designers, architects, stone and tile businesses, retailers and distributors are allowed access to millions of inspiring projects and settings they would never have seen before unless they conducted specific searches. Car manufacturer Buick put a social network spin on its 2013 Encore luxury car by reinventing its interiors and exteriors based on a Pinterest board. A couple of weeks ago, Daltile had asked their Facebook users if any of them had switched over to the new format. I left a comment and thought nothing of it, until they responded by asking me what I would like to see on their boards. Whoa. A major corporation asking me for my opinion? I commend them for not only asking and responding, but for taking action! Here’s the conversation that took place and the result of it. Daltile used Facebook to develop a new Pinboard by engaging with its fans. Therefore, it shouldn't be surprising that Coverings, always a step ahead of other industry-related shows, took the power of Pinterest and literally ran with it! You see, Pinterest is not just for recipes or beautiful settings, fashion trends, and so forth. It’s a business tool that brings attention to what a business offers, the company’s personality, its philosophy, and its interests. Basically, it humanizes entities and people alike. And that, my friends, is the secret to Pinterest’s success! Of course, it was only natural that Coverings picked up on this growing trend and took it to a new level by hosting a Pinterest contest, as well as including this hot topic into its comprehensive list of educational sessions, and all for no charge. The rules of this contest were simple. First, you had to have a Pinterest account for yourself. Then you had to follow Coverings’ pinboards. Once you were setup, and let Coverings know you were interested in the contest, they would start a pinboard in your name where you were encouraged to collect pin-worthy images of tile and stone products, installations, and materials. All they asked in return? “Promote your Coverings board to your friends and followers through your own social channels. In order to preserve copyright and trademark integrity, please pin only photos that can be attributed properly.” But how do you know what’s copyrighted or trademarked? Well, that’s where this panel discussion’s importance comes into light. Finally, the top four winners were determined by who attracted the largest number of followers to their individual Coverings boards by March 22. Let me assure you the competition was stiff. Each participant dedicated many hours and tactics in trying to secure their place within the top four. Pinterest is all the rage but how do you jump on board? How can you use it to promote yourself and your business? Where do you find what to pin and how do you pin? Join our panel of expert pinners, all gathered through the Coverings 2013 Pinterest promotion, as they discuss the ins and outs of how they use Pinterest to promote their brand and business. Plan to actively participate by bringing your questions and ideas -- this is your chance to unlock the mysteries of Pinterest and show your Pinfluence! I hope you can join us for what is to be one of the hottest, most-talked about sessions on the Coverings education schedule! See you in Atlanta!